29 Gilwern to Clydach at Gilwern Village car park01633 644850work Walking RouteThe route leaves Gilwern and follows the canal, riverside and minor roads gradually climbing up the Clydach Gorge. At Blackrock the route goes under the A465 and crosses the Devil’s Bridge then ascends the steep wooded hillside. From there it contours around the hillside following the disused railway line, now cycle way, before descending an old incline to the old Clydach Iron Works and rejoining the outward path. The route leaves Gilwern and follows the canal, riverside and minor roads gradually climbing up the Clydach Gorge. At Blackrock the route goes under the A465 and crosses the Devil’s Bridge then ascends the steep wooded hillside. From there it contours around the hillside following the disused railway line, now cycle way, before descending an old incline to the old Clydach Iron Works and rejoining the outward path. Points of interest include much evidence of this area’s industrial heritage such as Clydach Iron Works and its cast iron bridge. 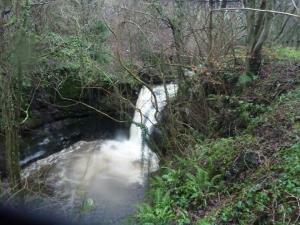 In contrast the route takes in the Cwm Clydach National Nature Reserve with its stunning beech woodland and waterfalls.